You know what’s better than a charger for your iPhone? A pair of jeans that can charge your iPhone. Sounds ridiculous doesn’t it? That’s because it is, and somewhat wonderful at the same time too. A new pair of designer jeans by Joe’s Jeans – named #Hello – aims to charge your iPhone while you wear it. 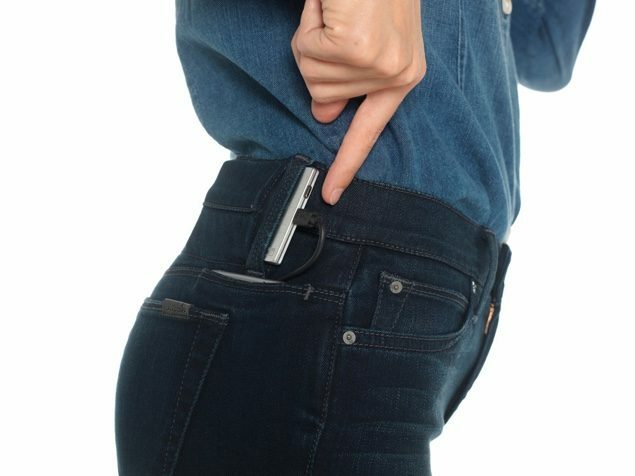 The idea is a rather simple one really; there’s a pocket for a battery pack at the back of the jeans, while there’s also a special pocket where a user would put their iPhone. The cable from the battery pack goes straight to your iPhone, subsequently charging the device when you’re on the move. There’s a small catch though; the pocket space in which you place your iPhone is rather limited. Which means that you can charge any iPhone you want except one. And we’re sure you’ve guessed by now which one we’re talking about here – the iPhone 6 Plus, thanks to its sheer size. Apart from that caveat, there’s another small downside to the aforementioned battery pack. It will charge an iPhone 5s from zero to 85%, and an iPhone 6 from zero to 70%, before it eventually runs out of juice. So it’s pretty clear that the battery pack won’t exactly last you through an extremely heavy day, or in a situation where you forgot to charge your iPhone overnight and went out on a road trip. But still, a charge up to 85% from zero isn’t that bad at all. At least it will get you easily through an average day. The price of the jeans is where things get interesting. The pair alone costs $189, which is not cheap at all, and you have to throw in $49 if you want that battery pack with the whole deal as well. We’ll go as far as suggesting that users should hunt down a massive battery pack that fits in the jeans’ dedicated battery pocket, making sure they’re secure in the power department for a full day. The big question is: should you buy the #Hello? If you’re asking us, we’d suggest otherwise. But if you want to take your Apple fanboyism to the next level, then go ahead. Our money says that users should invest in a decent battery pack instead, rather than a pair of jeans that costs a small fortune. But we’re pretty certain that a small subset of users are going to make the daring leap and go for the #Hello despite our advice. If battery retention is a real issue for you, then be sure to check out: Calibrate iPhone Battery [How To Guide].